A weaver at Historic Deerfield, Deerfield Massachusetts. Historic Deerfield is a nationally recognized museum offering tours of period houses and the Flynt Center of Early New England Life. 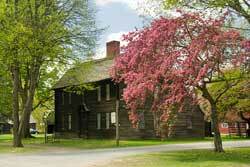 Historic Deerfield is open daily from mid-April through December. The Flynt Center of Early New England Life is open weekends January – March. For winter admission and VIP tour information, please visit our Hours & Admission page. Admission: $18 Adults (18+); $5 Youth (6-17), under 6, Deerfield/South Deerfield residents and members free. Please call 413-775-7214 for museum information and program schedule. Historic Deerfield also offers fine dining and lodging at the 1884 Deerfield Inn and Champney’s Restaurant and Tavern, and shopping at the Museum Store. 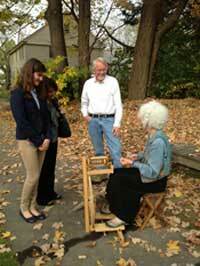 Woodworker Ted Ingram shows his skills at Historic Deerfield, Massachusetts. Steve Smithers teaches silversmithing at Historic Deerfield. Baking colonial style at in Deerfield, MA. Learning to write with a quill pen at Historic Deerfield. Paul Shoul photos.